Effective 11/29/10, Slaying the Sky Dragon is now #1 on the Amazon best seller list in the science category. We have a new must read book out today by authors: John O’Sullivan (Author), Hans Schreuder (Author), Charles Anderson (Author), Claes Johnson (Author), Tim Ball (Author), Alan Siddons(Author), Oliver K. Manual (Author), Joseph A. Olson (Author), Martin Hertzberg (Author), et al. Get a no nonsense read about the fraud surrounding anthropogenic global warming – Editor. Below is a description of the book and where you can order it from. To mark the book launch the ‘Slayers’ will publish a series of articles to highlight their scandalous findings. The first revelation comes from Mišo Alkalaj, a mathematician and head of Center for Communication Infrastructure at the “J. Stefan” Institute, Slovenia. Alkalaj refutes a fundamental claim made by the IPPC – in which ‘scientists’ have asserted they can distinguish between human-emitted carbon dioxide (CO2) and its naturally occurring equivalent. The claim is exposed as being without any scientific basis. It is an unsupported concoction of a lone UN insider cynically and fraudulently inserted into the UN literature as if it was accepted science. HURRY – GET TWO BOOKS FOR THE PRICE OF ONE! Each week further such telling revelations will be made. But don’t wait weeks to discover what you can read today and risk missing an even bigger opportunity. For a limited period we are making a special offer – not one volume but two groundbreaking books. Yes, as a special introductory promotion we are making an extraordinary ‘two for one’ holiday season deal. Buy Book One now for just $10.79 and get Book Two free! Make no mistake – readers of Book One will find the second volume as devastating as the first. ‘Sky Dragon Slayers 2’ (RRP $8.99). ‘Sky Dragon 2’ showcases the work of other authors in this extraordinary team. Among them is world-leading sea level expert, Nils-Axel Mörner, UN IPCC author Dr. Vincent Gray, renowned climatologist Hans Jelbring and leading Brazilian geologist and climate writer, Geraldo Luís Lino. So hurry, avoid disappointment this winter holiday season and order now by debit/credit card to have both books (value $19.78) for only $10.79. Remember, this is a limited offer and will not last. You can order the United States version here, or the British version here. Avail yourself of this historic opportunity to be among the first to own the epic work that finally kills off the greatest science fraud of all time. Share our message and play your part in bringing an end to the most costly science fraud in history! Looks like a worthwhile book to buy so I will try. I have always thought that the claim that human produced CO2 is different from that produced naturally was a false one so it will be good to know that my thoughts were right. It might also show that the term ‘greenhouse gas’ is a false one since the atmosphere acts in no way like a greenhouse. Find out that the laws of thermodynamics are correct for the atmosphere as well as everything else and we will be on the right road. At least Dr Hertzberg thinks this is correct. Is there a hard copy version? 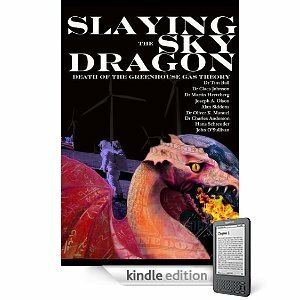 You can go here http://www.slayingtheskydragon.com/ and get more information now. I ordered and downloaded Kindle for the Mac and purchased your book. How do I get the second volume? Can you please email the second copy to me? I understand it is available for Adobe Reader.